Years have passed since the "Necrobe", a fungal agent capable of reanimating the dead, was released in several cities and small towns. 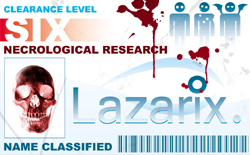 Though Lazarix Pharmaceuticals is known to have studied the dangerous spores for their astounding curative properties, what isn't known is how or why the engineered result was allowed to spread. As fungus-addled living corpses began flooding streets, other, more blood-thirsty beings emerged from the shadows. Vampires seem to be either seeking to destroy the zombie competition, or to simply feed on the remaining survivors. Quarantine borders are strictly enforced by a private security company known as "Mantis", and no one knows for sure just what's going on in the outside world. Within these walls, many questions remain. Not least among them is this... What will become of you? As a Surviving Human, you will face throngs of the undead. Using skills such as building barricades, hiding out and of course mastering combat, you just might make it. A sleu of weapons await you, from the customary Baseball Bat, Shotgun and Chainsaw to the occasional Frying Pan or Dead Fish. Your goal will not only be living to see another day, but also helping others through healing and even revival using a strange serum created by Lazarix Pharmaceuticals. Sure, your days may be numbered, but that doesn't mean you can't have a little fun. As a Zombie, you will feast upon both Humans and Vampires. Skills such as infecting your prey, hiding amongst corpses, and even using failed revivals to your advantage are in your ghoulish bag of tricks. Whenever a human dies by your hand, they will become a zombie. Hey… the more the merrier, right? Gang tactics are encouraged for zombie players, who can buy skills to recieve bonuses for attacking in groups and to (literally) sniff out others of your kind. The fungus that has reanimated you can even be strong enough to prevent others from reviving you. As a Vampire, you will feed upon Humans and attempt to destroy your Zombie competition. Your vile skills include shrugging off a percentage of all damage, unexpectegly attacking when others think you're deceased, and increasing your power along with your killing sprees. The blood of your enemies shall flow. Vampiric characters will find that feeding on the lifeblood of others can be quite refreshing… especially after a long day of sensing and searching out hidden players. Vampires are the born hunters of Serling's urban jungle. Action Points refresh every 5 minutes! 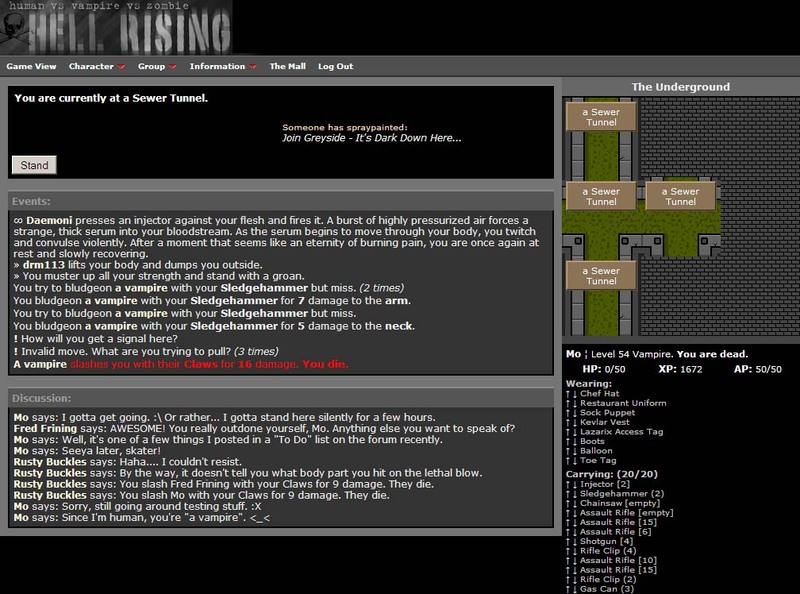 Hell Rising is a FREE browser-based, text-based, awesome-based survival/horror PvP game. Got it? It's Human vs. Zombie vs. Vampire, and the battleground is Serling. Quarantine is in effect, and eternal night is the norm. Join the Vampires and slake your thirst for Human suffering while you destroy the Zombies that threaten your blood supply. Join the Zombies and stuff your face with Human flesh while throttling Vampires who are so cruel as to steal your dinner. … Or join the Humans and fight back against the hordes of undead filling the streets. Any way you slice it, this should be an interesting night. Survive or die. Register! … Lost Password? … Problems? Choose your favorite game skin at any time by editing your profile. You can't play if you don't sign up! Get started now and create your very own human, zombie, or vampire. You'll be on the streets, stalking your chosen prey in no time! You'll need a valid e-mail address for this. • Learn the Lay of the Land! Maybe you have some questions about the mechanics of Hell Rising... or perhaps you just don't get it at all! 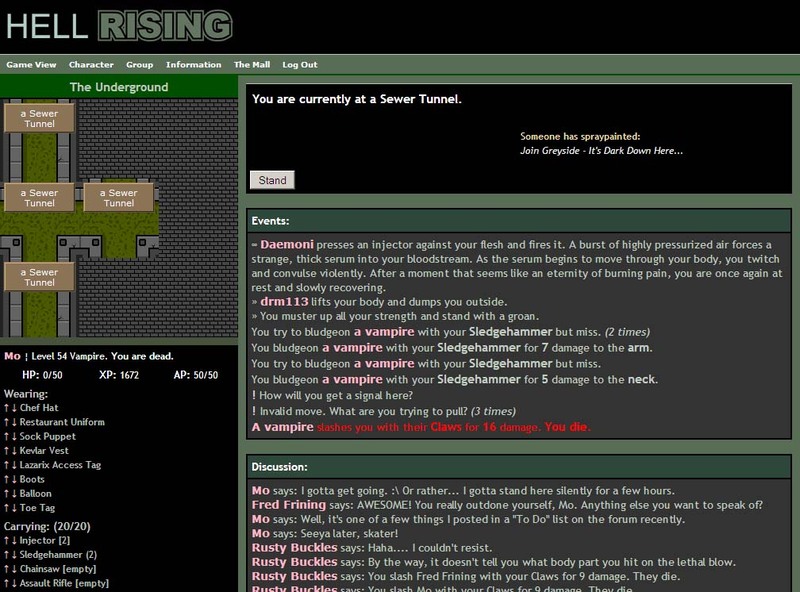 Check out the Frequently Asked Questions page on the Hell Rising Wiki for more information! 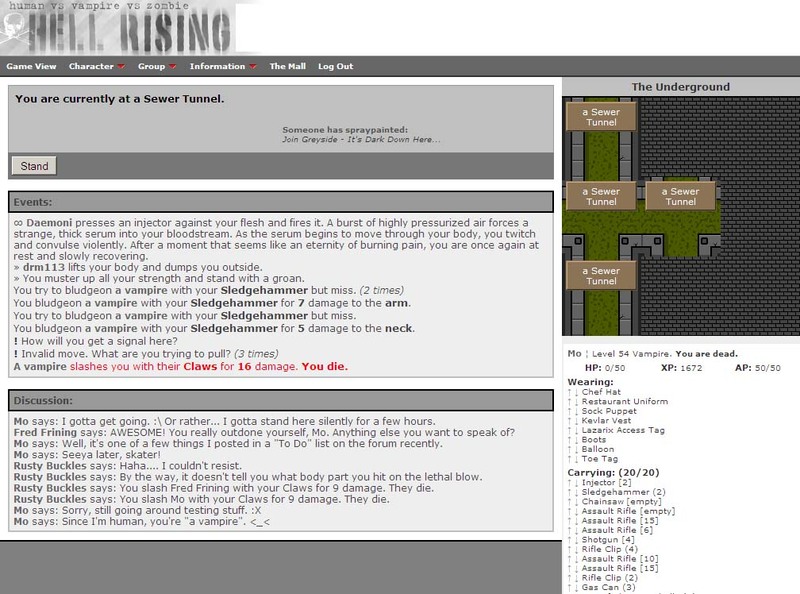 The Wiki will even tell you where to find items important to survival, or how to keep others from surviving! Okay, so you've played the game and want more. 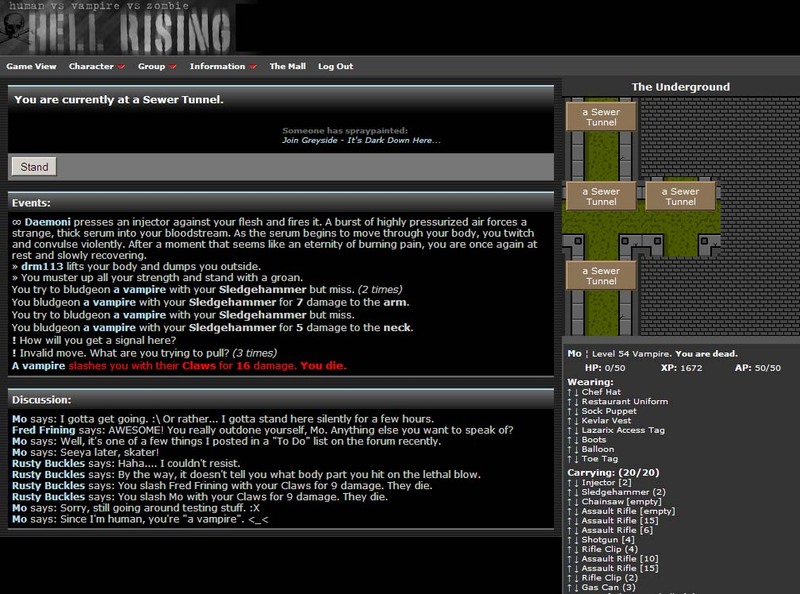 Check out the Hell Rising Forum and talk to other players like yourself... and some that are nothing like you! Variety is the spice of life (or un-life) you know. Don't be afraid! It's entirely up to you! There's no big payoff for donating... other than a customized armband, and the fact that you'll be supporting this game! You'll also get a personal and heartfelt "Thank You". Not an automated response.